Very difficult to climb due to a lack of footholds. Galvanised and can also be powder coated. Aaron Fencing supply both ‘D’ and ‘W’ profiles, but the type you decide on really depends on the level of security you need. D joists offer substantial security, whilst W joists make the structure trickier to climb. That said, if you were to opt for a pointed finish on either of these types, you’d make it extremely difficult for an intruder to make their way over the fence and onto your premises. This brilliant boundary is constructed out of steel and supplied galvanised, but it is also available in a range of standard powder coated colours.This itself makes it very cost-effective in the long run as you won’t have to worry about repairing or replacing a run down fence. 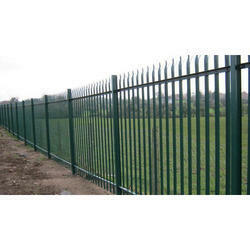 Can I order palisade fencing to be delivered and installed in Northampton? Absolutely. Standard heights on our website include 1.8m, 2.0m, 2.4m and 3.0m, whilst meterage options include 50m, 100m or 200m with all the component parts included, yet if you require a quote for a different quantity or specification you only need to give us a call. Aaron Fencing also supplies single leaf and double leaf gates, which are designed to match the fencing, and these can be made to order, whilst every gate is complete with two posts, a pad lockable sliding latch and drop bolts. If you’re currently on the lookout for palisade fencing in Northampton, you’ll be pleased to know that we can provide you with a complete, bespoke service, from a new installation to a large-scale repair. All of our installations use only the highest quality pre-treated materials, ensuring that the work we do offers you the greatest value for money possible, with a service that is second to none. Should I choose the ‘W’ or the ‘D’ design? The 'W' section is often preferred to the more traditional 'D' section as it offers increased security as the fastener head is more concealed, and therefore more difficult to tamper with. The 'W' pale itself is a stronger more robust profile. We offer our palisade with a choice of heads, including rounded, rounded & notched, single pointed and triple pointed depending on your needs. 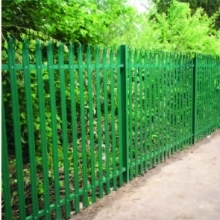 Our palisade fencing is supplied as a simple component system that can be assembled onsite. We are aware that whilst security is essential, many clients will also require an appearance that is not too intrusive to the surroundings. This is especially the case for schools and recreational projects, but we can powder coat each fence in a vast assortment of colours, including red, green, blue, white, grey, black, brown and yellow.